Friday March 30th, as Jews celebrated the first day of Passover—festival of freedom commemorating the Hebrews’ exodus from Egypt after they were freed from slavery—Hamas launched its “Return March” and called the population to walk towards the border with Israel. March 30th is the day when Palestinians commemorate each year the general strike organized on March 30th, 1976 in the Arab towns of Galilee and Negev in order to protest against State confiscation of land. On that day, six Arab demonstrators were killed by the Israeli police. 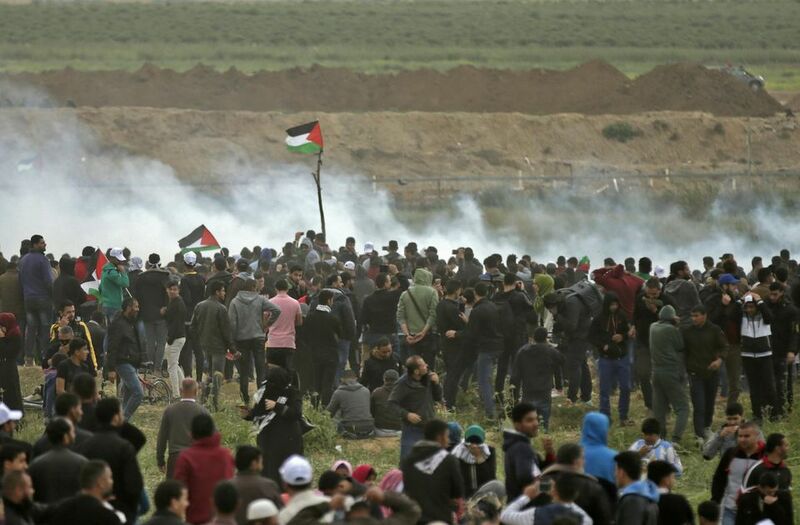 This time, the Israeli army had been ordered to shoot at all demonstrators threatening Israeli soldiers or trying to cross or damage the fence between Israel and the Gaza strip. Unfortunately, the ending of the scenario was predictable:16 dead and hundreds injured at the end of the day. Of course, Hamas knew very well the risk for its population, and it bears its share of responsibility for these bloody events. Besides, we should not absolve Hamas of the role it played in the humanitarian crisis which has been affecting Gazans for years, nor of its cynical use of that crisis in order to strengthen its grip on the Palestinian scene. Moreover, by maintaining the illusion of a feasible return to Israel of the 1948 refugees’ descendants, Hamas leaders only keep alive an impossible dream and make even more difficult a compromise solution. Last but not least, we should not forget that by stopping to pay salaries to its civil servants months ago, the Palestinian Authority contributed to the escalation of the crisis. However, Israel, and Egypt as well, bear a heavy share of responsibility for the distress of the two millions of Palestinians Gazans under siege who, lacking water and electricity, cannot meet basic needs. Of course, Israel must protect its population against incursions into its territory of armed men determined to carry out terrorist attacks—as was very recently the case. But it cannot deny Palestinians the right to demonstrate in a pacific way in order to protest against their present condition. It is time to end that state of things, and to restore hope for a different future in both populations. Each year, by celebrating Passover, we pronounce the ritual sentence: “Once we were slaves, now we are free men.” Israelis won’t be able to reach that freedom until the day when their country will stop occupying another territory by denying its population its right to independence. You will find all the information on the agenda of the conference on our website. Beware ! Advance registration is imperative. We wish you and your loved ones all the best for the feast of Passover.. Hoping that the voice of reason will win and that a new unnecessary conflict will be averted. Hag sameah.